Having been to a couple of electronic dance music (EDM) events, one of the traditions I love is the exchanging of kandi. Kandi primarily takes the form of bracelets, but I wanted to create something extra special for my friends to fit the Coco theme of one of my outfits. I decided to make necklaces with miniature pinatas attached to the end. 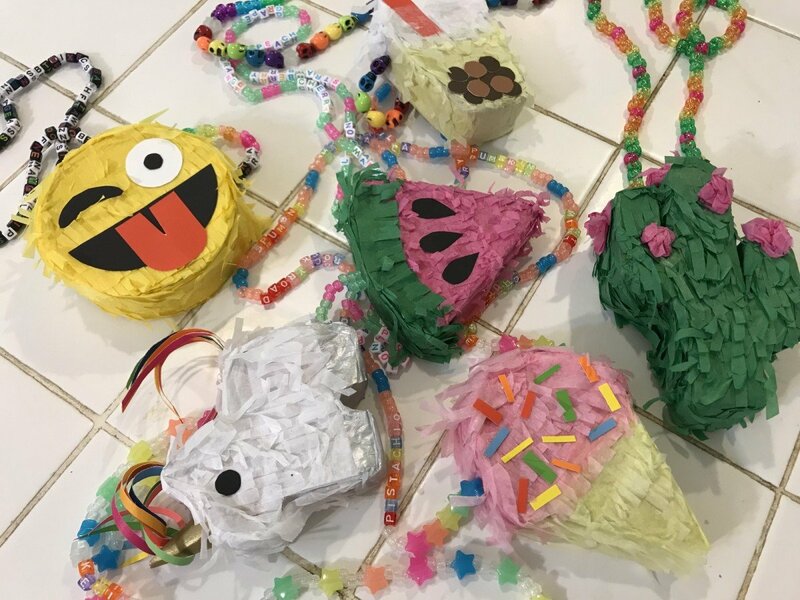 The process of creating the pinatas was surprisingly simple. I wanted to share more about the process of making these bracelets, in case you may be interested in making your own. At the end, you can also download the patterns I created to make my pinatas. I’ve had many boxes from moving to San Francisco for some time. Consequently, I had nice cardboard to work with. For the six pinatas that I made, I used less than one side of this extra large box. I used the size of this panel to determine the overall size of my miniature pinatas. From there, I set out to figure out what I specifically wanted to create for each friend. I settled on creating a cactus, watermelon, cup of boba, emoji, ice cream cone, and unicorn. I designed the shapes on my computer before printing them up and tracing them onto the cardboard. Eventually, I had shapes that looked like the piece below—two for each pinata I was making. Cutting a long strip of cardboard perpendicular to the corrugations, I proceeded to hot glue one side of the edge of the pinata. I found that gluing a small portion first, especially near curves, and letting it cool down completely, was essential to forcing the pinata to maintain its new shape. Once you have a part that is glued and cooled down, it’s much easier to continue forming the pinata. I started gluing where I wanted the opening for actual candy to be. Even though I left an opening for my friends to stash candy, in the end, I ended up leaving the pinata empty—I didn’t want them to be carrying around extra bulk. After finishing all the cardboard work, I started beading. The process was pretty easy. Just figure out how long you want the necklace to be and add a little excess for securing the ends. I created two holes in the cardboard pieces, took my fishing line, secured one end inside of the pinata, and started adding beads. Perhaps the most difficult part of the process was securing the opposite end. I carefully tied the end with a bead and added hot glue to make sure that my work was not undone. A tip if you’re working on necklaces with letters. Be sure to order a little more than you need otherwise you will have to work extra hard to find words that don’t have “E’s” in then. After completing the beading process, I went about adding paper to the outside. I used tissue paper that came in an astounding number of colors but in retrospect I should have used something that was a little heavier like crepe paper. Even thicker tissue paper would have been better than what I used as it the paper so thin that the glue would often get on my hands and undo what I had just done. I used a mixture of half water, half white (PLA) glue that I brushed onto the part that I wanted to work on. After cutting partway into long sheets of paper, I layered the sheets horizontally along the surface I just brushed. On occasion the tissue paper would turn to a lighter color. This worried me at first, but eventually I found that the color would come back after the tissue paper had dried. I hung up and air dried each side before proceeding to the next. Any details below, like the seeds or sprinkles were added with cardstock after I finished gluing the tissue paper on. I used undiluted white glue to add these details to the pinatas. Here are some of the finished miniature pinata necklaces. The necklaces were well received and after a full night of dancing lasted the entire event. Only one necklace broke apart, sadly, but this was after it had snagged on something. All in all, I’m quite happy with how these turned out. If you happen to make your own, I would love to see! Stay up to date on all things httpkoopa. Subscribe today!